When did this little tiny baby turn 11 months old? Next month on St. Patricks day she will be a whole year old. How is that possible already? It feels like yesterday she was being brought home wrapped in her GoGo from Puckababy, I wish she could still fit in it all snuggled up. It was definitely one of the best baby buys we made. 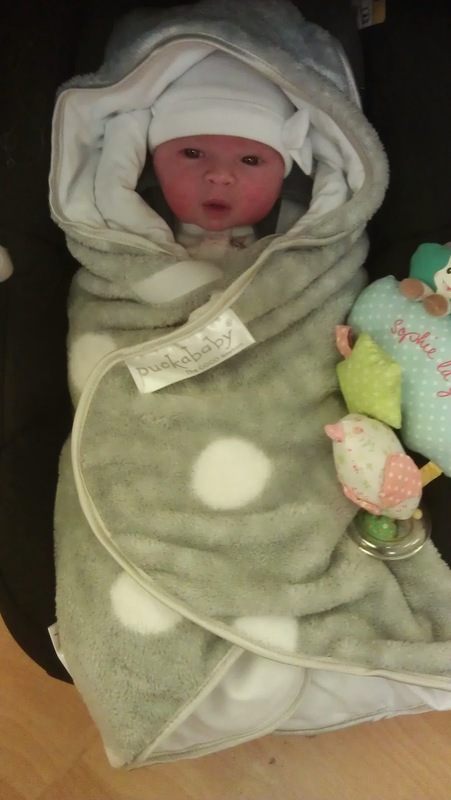 I love puckababy products, she also had an original piep too which we used to swaddle her when she was tiny. Currently we only have a blanket by puckababy which makes me sad. One item I have used every day since she was born is my Snoob breastfeeding scarf... to this day, if I leave the house without one I will make Michael turn the car around because I feel so much more confident to feed with it, even if I don't need to feed while we are out I like to have it on me just incase! You never know. So it's definitely a product I would suggest to any expecting mother wanting to breastfeed. Even if you're confident enough to go without covering up, I think it's still a nice thing to have because there's always a situation where you don't want to be uncovered. I am so proud of myself for still breastfeeding Isabelle at 11 months. She is also topped up with Neocate formula at night time before bed but I'm still breastfeeding her which I'm so proud of. I could of given up a million times because it's hard but it is so so worth it. I have loved breastfeeding... so much so that I've given up dairy and eggs to do so! At 11 weeks old Isabelle was diagnosed as cmpa (cows milk protein allergy) but it wasn't until 10 months of age I realised she reacts to egg through my breastmilk too. At 11 months old Isabelle is: Dairy, egg, wheat, soya, potato, broccoli, peaches and mango free. Her favourite foods at the moment are tuna,sweet potato roasties, spaghetti bolognese, coconut yoghurts and kiddylicious smoothie melts... oh and coco pops! which are actually dairy free - who would of thought, they are but some crisps arent?! She loves to feed herself. Isabelle is wearing size 6-9 month clothes now, we haven't had her weighed in a while but I will at her next hospital appointment. 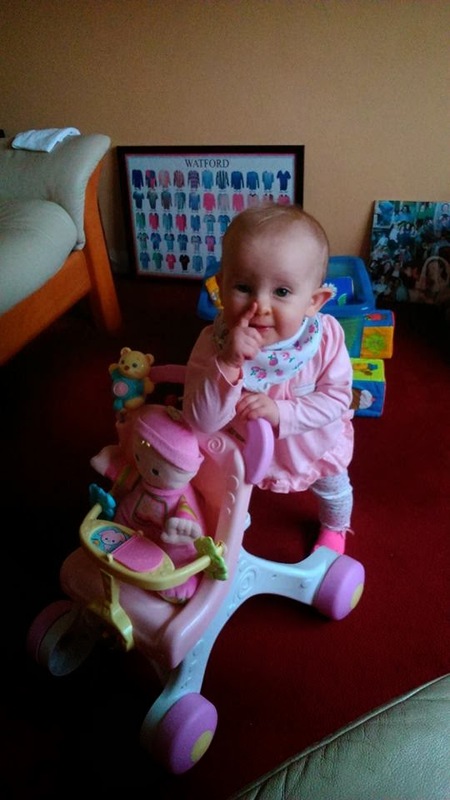 She's got really good at walking around pushing her little pushchair, I think she will walk before her 1st birthday. Better start planning her 1st birthday?! Sometimes she sleeps through the night - not very often. I hold her for 1 nap mid morning and she has her afternoon nap in her pushchair while we are walking. She seems to say "yeah" alot... but shes just making sounds. She likes to wave and point at everything! She adores Oliver... until she decides she's teething and his foot will do as a teether! Today, 25th Feb Isabelle started kissing me... on the lips.... then bit my lip REALLY hard. Then laughed her head off.